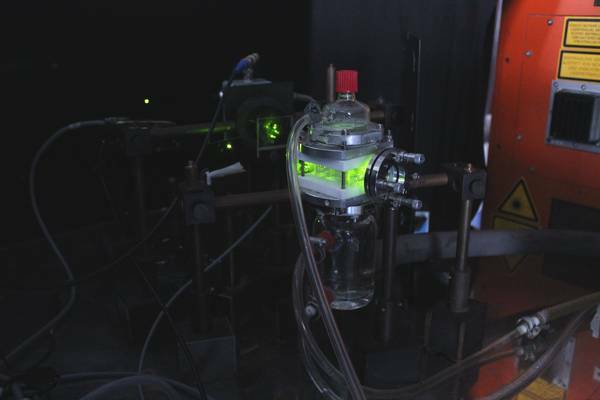 Laser-based studies of atmospheric radical reactions in aqueous solution are a major activity in the aqueous-phase laboratory. These reactions are of importance for chemical processes in haze particles, fog, rain and clouds. In order to investigate the kinetics of oxidation processes of organic compounds (alcohols, carbonyls, acids, aromatics) within the tropospheric-multiphase-system reactions of OH, NO3, SOX- and halogen radicals are characterized as a function of temperature, pH, oxygen content and ionic strength. 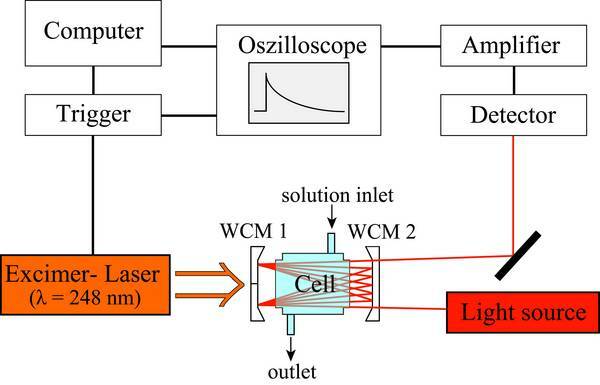 Therefore, a laser flash photolysis long path absorption setup based on the method of the flash photolysis is used (Figure 1). Figure 1: Scheme of the laser flash photolysis long path absorption setup. The experimental setup consists of a multi gas excimer laser (Kr/F2, Xe/Cl2, or Xe/F2) for the radical generation, which has a pulse length of 10 - 40 ns and emits a specific wavelength (λ = 248 nm, λ = 308 nm, or λ = 351 nm). As light sources both continuous wave lasers (Argon ion laser, diode laser, He-Ne-laser, He-Cd-laser) and lamps are used. In order to increase the optical path length of the light a White cell mirror configuration is used (Figure 2 and 3). Photodiodes, photomultiplier, diode arrays as well as CCD-cameras are used as detectors. 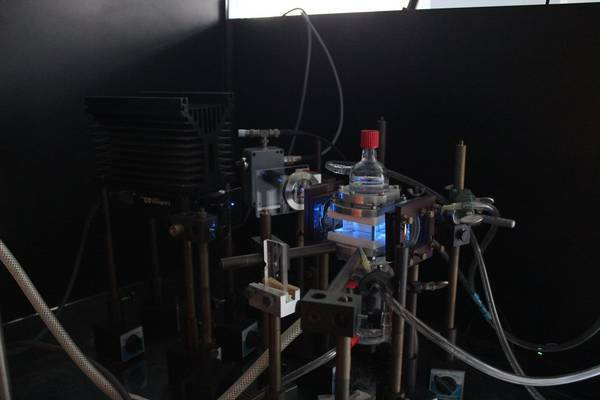 The experimental setup can be used for both kinetic and spectroscopic studies of short-lived transient species (e.g., organic peroxy radicals). Figure 2:	White cell mirror configuration in order to increase the optical path length through the measurements cell for the investigations of the sulfate (SO4-) radical in aqueous solution. Figure 3: Measurements cell for the investigations of the OH radical reactions in aqueous solution.